From sushi and karaoke to martial arts and technoware, the currency of made-in-Japan cultural goods has skyrocketed in the global marketplace during the past decade. 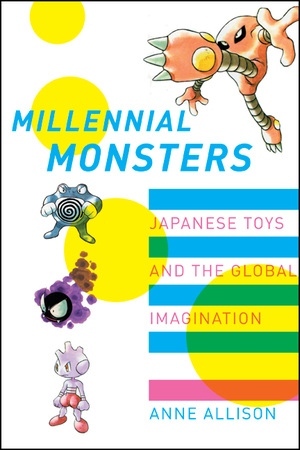 The globalization of Japanese “cool” is led by youth products: video games, manga (comic books), anime (animation), and cute characters that have fostered kid crazes from Hong Kong to Canada. Examining the crossover traffic between Japan and the United States, Millennial Monstersexplores the global popularity of Japanese youth goods today while it questions the make-up of the fantasies and the capitalistic conditions of the play involved. Arguing that part of the appeal of such dream worlds is the polymorphous perversity with which they scramble identity and character, the author traces the postindustrial milieux from which such fantasies have arisen in postwar Japan and been popularly received in the United States. Anne Allison is Professor and Chair of Cultural Anthropology at Duke University, and author of Permitted and Prohibited Desires: Mothers, Comics, and Censorship in Japan (UC Press, 2000) and Nightwork: Sexuality, Pleasure, and Corporate Masculinity in a Tokyo Hostess Club (1994).